Reading authentic material - i.e. texts that have been written for native speakers - is an excellent way of improving your reading skills. In a previous post I wrote about reading French novels but If you find it too daunting or if you struggle to find time to read a novel, there are many other enjoyable alternatives online that will allow you to progress. Illustration blogs may be exactly what you need. The blog posts are short and full of humour. They are up to date, give you an understanding of the way your French contemporaries communicate and provide an insight into the culture you are studying. In his blog about gastronomy, Guillaume Long illustrates recipes, anecdotes, portraits and tips. Martin Vidberg illustrates in his very own way daily news. The illustrator Lisa Mandel and the political scientist Julie Pagis are following the French presidential campaign from an off the wall observation point : a primary school in a Parisian suburb. They tell us what the children perceive from the presidential campaign. 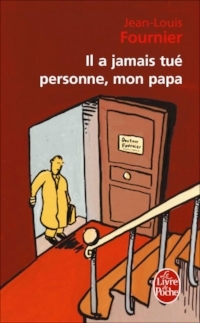 Fabrice Erre is a History and Geography teacher and a cartoonist. In his blog, he draws with humour the daily life of a teacher who works in a Senior High School. Two childhood friends illustrate the world of sport. Reading in French allows you to increase your vocabulary and get a better grasp of grammatical structures. There is a wide range of texts you can choose from : there are magazines, newspapers, blogs … and there are novels. Reading a novel in a foreign language can be challenging but as soon as you finish your book, you experience a wonderful sense of achievement and pride. I will always remember finishing La casa de los espíritus by Isabel Allende in Spanish. Not only did I enjoy the story but also I felt a real sense of accomplishment. It is important to choose a novel at the right level. If you choose too challenging a book, you have more chance to get frustrated and quickly give up. Once you have selected your book, you can find an electronic version. Reading on a e-reader or tablet will allow you to look up unknown vocabulary easily. You just need to download a French dictionary and a bilingual dictionary. Looking up words becomes faster and you are able to review them at the end of your reading session. You can also listen to the audiobook version of your novel while following the words. However, I would recommend reading each chapter first as the reading pace may add an extra challenge. Jean-Louis Fournier portrays his father through the eyes of the child he used to be. His father was a generous doctor, who looked after his clients even if they could not afford his consultations. He could be light-hearted and full of humour, but he was also an alcoholic and could be bad-tempered, irresponsible and cruel when he had had too much to drink. This bitter sweet and moving novel is made of short chapters and successive anecdotes which are accessible to intermediate learners. Monsieur Linh is an elderly Vietnamese refugee who has endured a long journey by boat with his baby grand daughter and one old suitcase. He has seen his homeland destroyed by foreign soldiers, his village, fields, buildings and population burnt and killed, including his son and daughter-in-law. All that is left is the baby, Sang Diu. Monsieur Linh arrives in a city in France, and is moved to a refugee centre where he lives in a dormitory like place with other refugees. He is lonely, homesick, deeply traumatised, only living to devote his whole self to his care of the child. This is a moving story that make us think about the fate of refugees. The vocabulary and the structures are simple. Erik Orsenna makes us love words and French grammar with his poetic, fun and moving tale. It is the story of two children who are castaway and who lost their vocabulary during the storm. While discovering the island where they landed, they recover, little by little, the power of speech. An endearing story for young and old. In Ni d'Ève, ni d'Adam, Amélie Nothomb writes about her private experience when she was living in Japan and tells us about her love story with Rinri, a young Japanese man who wanted to learn French. We discover another side of Japanese culture. This is a charming book. the vocabulary and the style are not challenging. Sorj Chalandon, a former journalist for Libération, who covered events and wars in Lebanon, Iran, Iraq … wrote this violent and yet emotional story. Le quatrième mur is the story of an impossible dream, a story of hope beyond hatred. Sam wants to produce a play in Lebanon with actors from the different communities at war. As he gets ill, George will help him pursue his dream by going to Lebanon and staging Antigone. This book will not leave you unscathed. It shows the abyssal gap between our lives and the ones of people who live in countries devastated by war. Of all the things I have mentioned above, I think that choosing the right length and level of book is the most important. However as with anything you get out what you put in! If you challenge yourself and keep going the satisfaction and sense of achievement will be worth it. If you feel daunted by watching a full-length feature film in French, or if you simply do not have enough time to do so, why not watch a short-film? Short films will help you improve your French just like any full-length feature films. They are as enjoyable. It is incredible how directors of short films manage to fit an entire story into such a little amount of time! 1. Watch the film a first time without any subtitles and try to understand as much as you can. Watch it a second time and use your remote control to catch words / sentences you did not get the first time. 2. If you struggled to understand some words despite your best effort, watch it with French subtitles. 3. If necessary and if it is available, watch it with English subtitles. 4. Finally, write down the new vocabulary you have been learning and/or create flashcards using a website like quizlet.com. Here are 4 French short-films that my French students enjoy, which one is your favourite?